The Rockford Files was a 60 minute detective drama series on NBC about an ex-con private investigator. He had a natural mis-trust of the police and the legal system in general as he had been wrongly convicted of armed robbery. Luckily, new evidence proved his innocence and he was released. Often, he would get involved in closed cases that the police felt had been solved. Rockford would find evidence to suggest that the police were wrong. He also typically underestimated how difficult it would be to find the true perpetrators and to convince the police that he, not they, were correct. He wasn't the typical tough guy PI as on most other series. He would prefer to avoid a fight where possible. NBC executives initially had some problems with the Rockford Files' scripts as they felt they were too funny for a serious detective series. 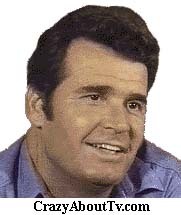 At first the writers complied with demands to remove those comical lines but eventually both they and James Garner refused feeling that was one element that made the TV show unique. It may have helped keep viewers tuned in to NBC too because The Rockford File initially aired directly following two comedies, "Sanford & Son" and "Chico & the Man". The theme song for the series is simply titled, "The Rockford Files" and was written by Mike Post & Peter Carpenter. The tune was very popular and heard regularly on the radio during much of 1975. For those superstitious folks, you might want to note that The Rockford Files first episode aired on Friday the 13th and yet, it lasted six seasons! Jim Rockford didn't exactly live like a king. Despite the fact that he charged $200 per day plus expenses (a lot of money in the mid '70s), he lived in and worked out of a house trailer. The name Rockford was chosen when writer Stephen J. Cannell found it in the Universal Studios employee directory. James Garner is a big man. According to a 1959 Time Magazine article he was 6 foot 3 inches tall. He weighed 206 pounds. He was not overweight by any means. His chest was 44 inches, his waist a tight 33 inches and his hips were 40 inches. Before acting, he worked as a model. He is part Cherokee Indian. At age 16 he joined the Merchant Marines and received a Purple Heart for injuries suffered in the Korean War. Robert Donley portrayed Jim Rockford's father in the Rockford Files pilot episode and then Noah Berry Jr. got the role for the series. According to James Garner, the license plate number (853-OKG) on Jim Rockford's Firebird was thought up by his agent. It represents August of 1953 when Jame Garner got his first acting role and the OKG comes from his home state of Oklahoma and the first letter of his last name! The reason that the final season of the Rockford Files ended in January, half-way through the season, is that James Garner had been experiencing a series of health problems and he was also getting a bit tired of the role. During the final short season, Tom Selleck appeared in the role of, "Lance White", a "smooth" private investigator who always had all the answers before Rockford and got those answers with seemingly no effort. To say the least, Rockford really resented him. Tom Selleck went straight from his role here to the very similar role of, "Thomas Magnum" on the series, "Magnum P.I."! Two other stars from Magnum P.I. 's cast, "Larry Manetti" and "Roger E. Mosley" also appeared on The Rockford Files in guest roles and one episode of Magnum P.I. included a discussion of a Rockford Files episode. Jim: "This is Jim Rockford. At the tone leave your name and message. I'll get back to you." "Jim, It's Norma at the market. It bounced. You want us to tear it up, send it back, or put it with the others. "It's Laurie at the trailer park. A space opened up. Do you want me to save it or are the cops going to let you stay where you are?" "This is the Message Phone Company. I see you're using our unit. Now how 'bout paying for it!?" "This is Mrs. Mosely at the library. We billed you for your overdue book Karate Made Easy. We abuse our library, we don't get our cards renewed." Thank you for visiting our The Rockford Files page!